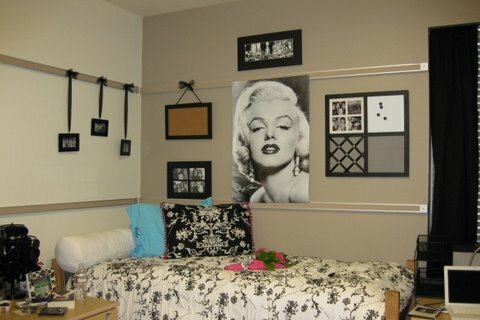 With great ideas for decorating dorm rooms, you can make your dorm room stylish, fun, functional and portable. 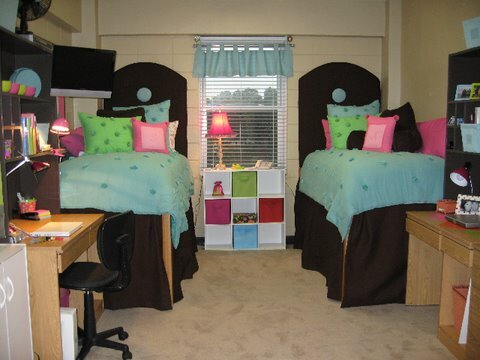 "Your typical dorm room with the drab block walls that we aren't allowed to paint.... as moms we all try to create that home away from home feeling for our children leaving the nest!! Of course, those 1st pics of "our" creation for them is the only time it will look great! - Neat & clean, etc.! So these were taken on moving day! We made matching headboards & my talented mother pitched in on the sewing of the dust ruffles! The comforter & pillows I got from PB teen! - Along with the splurge on the rug (which was actually the inspiration for the room!) We had the old bulletin board & painted that to match. Our daughter loved her "new" room! " 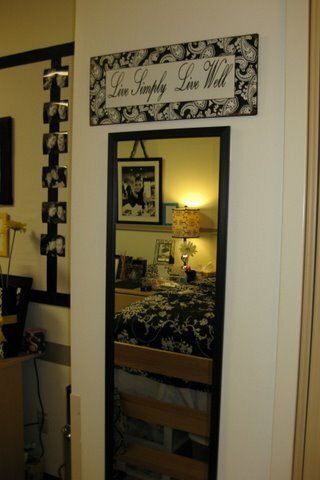 Ideas for decorating dorm rooms are usually not on the list of main priorities when you’re heading off to college. Once you see that tiny space, however, you’ll probably go on an all-out campaign to come up with a multitude of dorm room designs to transform it into your own little home-away-from-home. From cozy and comfortable dorm room designs, to wild and funky dorm room bedding and accessories, you’ll want to make that space reflect your own tastes; you’ll likely be searching for quirky dorm decorating ideas to make your room the one where all your future dorm-mates will want to hang out. Before you forge ahead and begin buying furnishings and accessories, consult with your roommate. 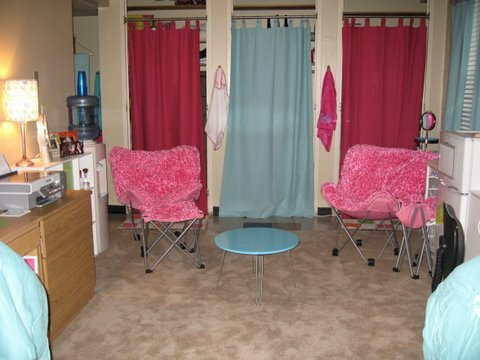 You may not agree on dorm room designs. If you and your roommate don’t like the same style or colors, search for dorm decorating ideas that use a neutral color scheme as a base. Splashes of color in your dorm room bedding and in personal accessories will label your style and define your individual space. Consult a color wheel for examples of compatible color combinations. For privacy, use laundry lines draped with colorful sheets or fabric to partition the space. Install a double line on a pulley system to allow flexibility for those times when privacy is desired. 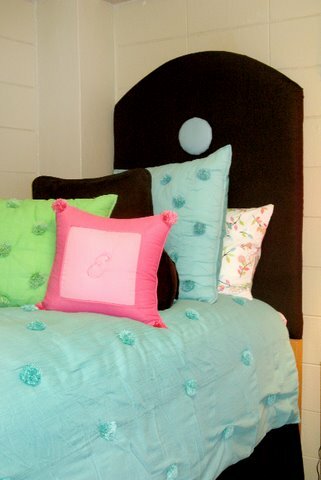 A big consideration in dorm room designs is the color scheme. Dorm room bedding, fabric, accessories, and wall décor are the tools of color transformation – most schools won’t allow painting the walls. By using a variety of textures and fabrics for dorm decorating, ideas for adding color and defining style are then limited only by the use of changeable accessories. Solid color dorm room bedding allows for a more balanced décor than bedding that has bold designs; the use of patterned throws and pillows are much easier to decorate around than a big striped or flowered comforter. "My roommate and I decided to use black and white with accents of yellow and turquoise. With a little bit of space we managed to make our dorm room well warm and homey. It is a place that we both can come and relax after a long day of school and professors. It is a fun space that everyone in our all loves to come to and hang out. The hard part of decorating dorms is no nails no paint nothing that will ruin the walls but I hope you enjoy!" "This is my desk and what we call our "TV" wall. I covered the cork board with white fabric and then added the black ribbon." Color the walls with fabric; use liquid fabric starch as the adhesive. If the walls are concrete or stucco, the fabric will come right off with water. For wallboard or sheetrock, use Blutac or 3M wall hanging putty. Several strips across the top and bottom will usually hold the fabric in place and leave no residue when removed. Warm up those commercial-grade tile floors with carpet. Room-size remnants or rugs are fairly inexpensive at discount stores. Carpet tiles are a cool option; salesman’s samples are often given away free or sold for pennies on the dollar at carpet outlets. The different colored tiles make a fun design statement. Big posters add bright color and define style and personality. Some movie theatres give them away free of charge. "This is my side of the room. We could not put any nails in the wall instead I used tool and tied it to picture frames and hung them from the cork board stripes! I thought it was fun and cute! I got the bed spread at target and had the pillows made." 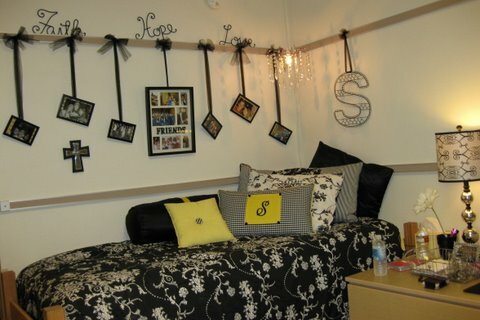 Dorm rooms are short on space, so organization is a big factor when pouring over those dorm decorating ideas. Stackable milk crates are the most common storage for a limited space, but they don’t have to look cheap; place a strip of Velcro around the top and sides, and cover them with fabric that coordinates with the dorm room bedding. Put the bed on risers or concrete blocks to create under-the-bed storage; make or purchase slide-out drawers or shelves on casters to keep shoes neatly tucked out of sight but easily accessible. "The two dressers are between my bed and my roommate’s bed"
The bed can serve a dual purpose; stack two or three long bolster pillows along the wall-side of the bed; add throw pillows to create an instant sofa. Paint plastic stackable drawers using spray paint formulated for plastic. This is a great way to add extra dresser drawer space for socks and undies; they’re narrow and don’t take up much room. Need more storage? Decorated steamer trunks make a great coffee/eating/study table. Overhead florescent lights in dorm rooms produce flat lighting that doesn’t lend well to any décor. Thankfully, you have options: tall torchiere lamps soften the lighting and add drama by creating light and shadow; mid-sized floor lamps with a bendable gooseneck can be moved to accommodate those study hours at the desk; holiday lights strung around the ceiling add a bit of whimsy. Another option - use mirrors to bounce light around the room and add visual space. 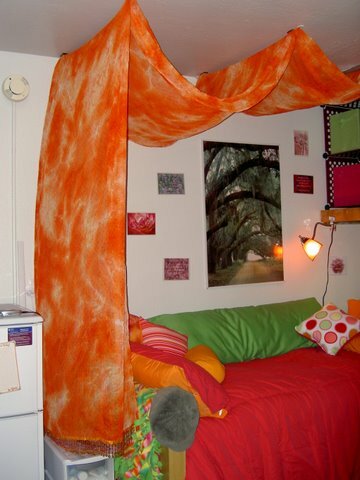 You can come up with more ideas for decorating dorm rooms on your own-just use your imagination! Remember, whatever you put into the room has to be carried out at the end of the semester, so keep it simple, efficient and comfortable. "I bought some 3M sticky things that had small hooks in them. I stuck 4 of them up (2 in the middle and 2 at the back end) and then I used clear fishing line and tied them to each of the hooks ... very tight so it would hold the fabric for the "swoops." I also used some double sided velcro strips that also had strong adhesive on both ends and put a few little squares, attaching them to the ceiling and fabric (reinforced by sewing strips to fabric), so they would stay in place. The top end, I ran a long strip of that double-sided velcro adhesive and stuck it up that way ... that held really good! I just wished I had that velcro stuff in white so it woulnd't be seen as much ... all I had was brown. If I did it over again, I think I would do those long strips of velcro for all three areas, and not use the fishing line - that was kind of a pain to get up there. I hope this wasn't too confusing!"